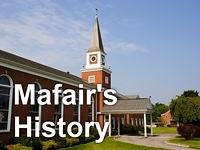 Mafair UMC: Seven Last Words - The Word of Substitution: "Why Have You Forsaken Me?" Seven Last Words - The Word of Substitution: "Why Have You Forsaken Me?" "Seven Last Words - The Word of Substitution: 'Why Have You Forsaken Me?'" is the sermon given by Rev. Jim Goddard at Mafair UMC on March 23, 2014.